The weather on the sun can be particularly volatile and violent, as shown by a new video from NASA’s Solar Dynamics Observatory (SDO). 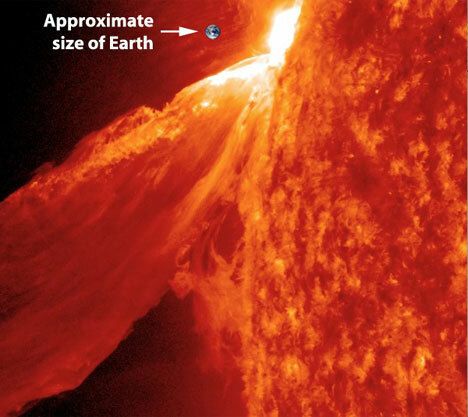 This gigantic solar eruption on February 24, 2011 was many times the size of Earth and sent plasma shooting out from the super-hot outer atmosphere of the sun. The plasma flowed along a complex system of magnetic fields generated by the sun’s powerful core, then some of it drained back to the sun along those same magnetic lines. Solar weather isn’t just incredible to look at; studying it can help astronomers figure out when the next big solar storm is coming. A really big prominence eruption toward Earth could upset communications and even knock the power grid offline, so scientists are keen to figure out the patterns behind the sun’s weather. For the rest of us, though, it’s a spectacularly entertaining show. See more in Space & Time or under Science. March, 2011.